c-span.org. was three giant networks in a government supported service called pbs. small network of rolled out a big idea. let viewers decide what was important to them. topan opened the doors washington policymaking for all to see. bringing you unfiltered coverage from congress and beyond. this was true people power. in the 40 years since, the landscape is clearly changed. broadcasting is given way to narrowcasting. 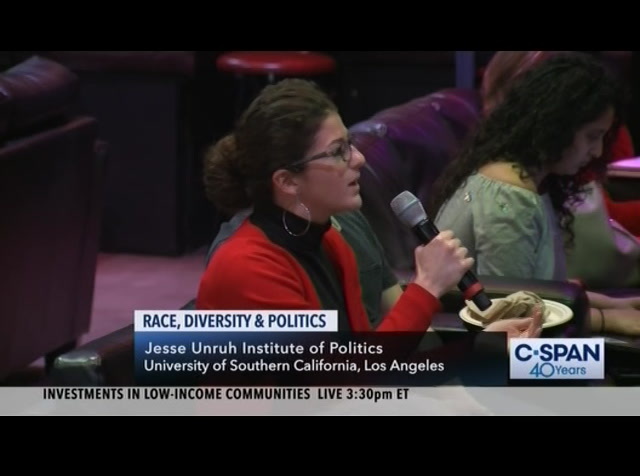 youtube stars are a thing, but c-span's big ideas more relevant today than ever. no government money support funded by is publicly your cable or satellite provider. c-span is your unfiltered view of government, so you can make up your own mind. 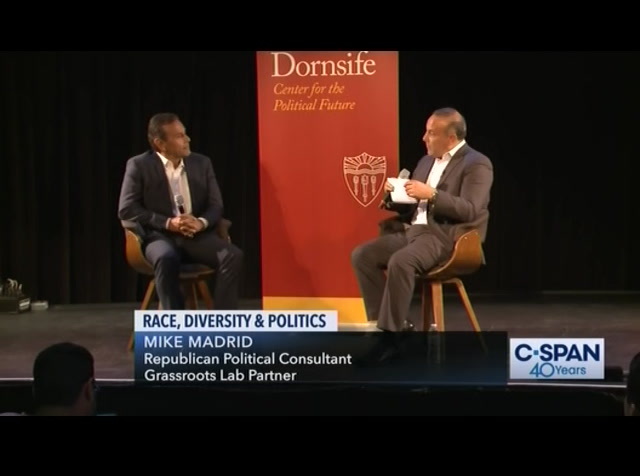 next, a discussion about to race, diversity, and politics with a former los angeles mayor and a political consultant mike madrid. they spoke recently at an event at the university of southern california for about one hour and 45 minutes. >> thank you all for coming. appreciate the series that has been set up here by usc. i do have a couple of announcements. this thursday, april four, former secretary of state john kerry will present a keynote address for climate ford, navigating the policy for climate change. will share his experience negotiating the paris agreement on climate change as well as the progress. politics, and we started the black student union. 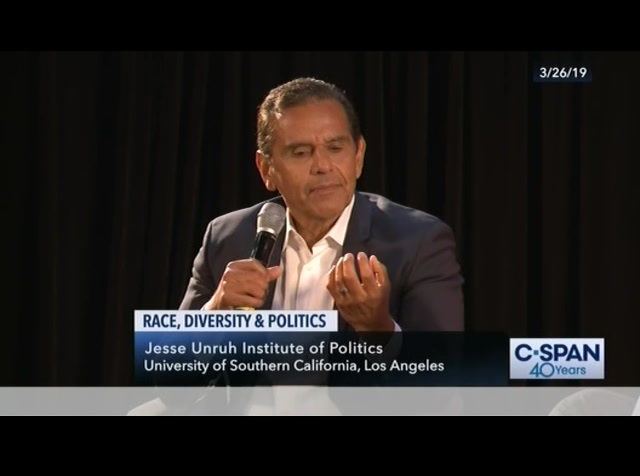 a couple months later, i helped found the united mexican-american students, had ts.kouts, boycot it was the 1960's, and there was a lot of energy around this notion that we needed to open up our country. in my case, have a real voice here in los angeles. and, was the labor leader after that, a community organizer and a labor leader, for 25 years before i got elected. 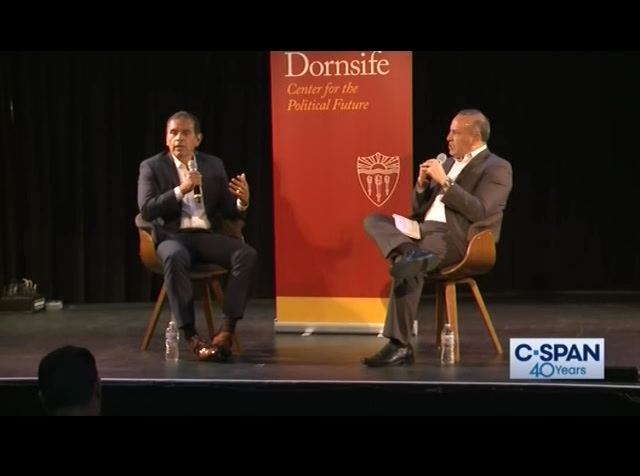 when people talked about how i rose so quickly to the speakership two years after getting elected, i tell people it's because i have been around. i had been an organizer for most of my life, not just for one or two years. a good part of my life. then, i didn't actually get elected until i was close to 40.
you are right, it is said that i was a progressive before the word became popular. at the time, people described themselves as liberals. many of us described ourselves as progressives, championing issues like assault weapons in the 90's, criminal justice systems that were broken, disproportionate, the impact on blacks, latinos, poor people. the prison building environment we were in, under the health -- offering the largest expansion of health care since medi-cal at that time, 750,000 kids got health care, in a large school bond in u.s. history. what was important about it is that it was the first time we put money in urban schools. we used to pass bonds and the money would go to the whole states, and would go to the rural places, and people voted vote for that. i changed that. 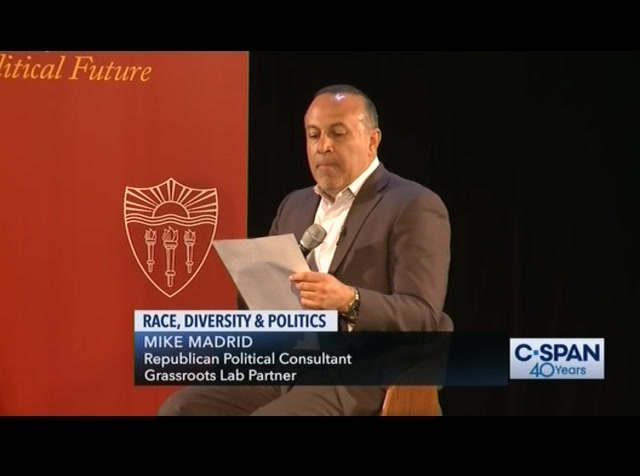 mr. madrid: how was it possible that you are the moderate in a race for governor given this really progressive policy position to be on? you are the forefront of these issues. 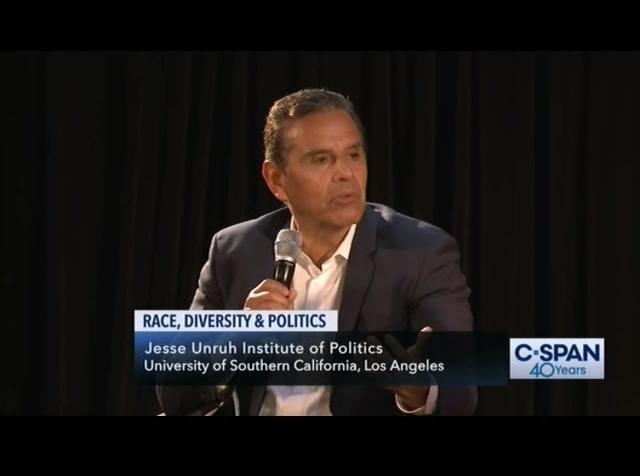 those were not particularly politically popular issues in california. 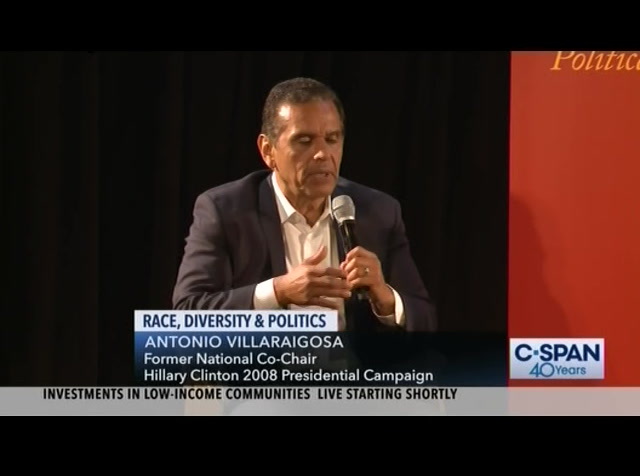 mr. villaraigosa: no question about it. i think because we put people, we love labeling people and putting them in categories. while i am a progressive, i am also practical. i was mayor of los angeles in the worst recession. the economy was in tatters. i had to make a lot of tough calls including calls against friends. powerful unions, for example. although i've come out of the labor movement, i was not just a community organizer, but a labor leader. we were going bankrupt, and i had to make tough decisions. because of those decisions, people put a label on that wasn't accurate, but sometimes that happens. mr. madrid: do you believe that as speaker specifically you were reviewed -- we are going to get to your tenure as mayor in just a bit. 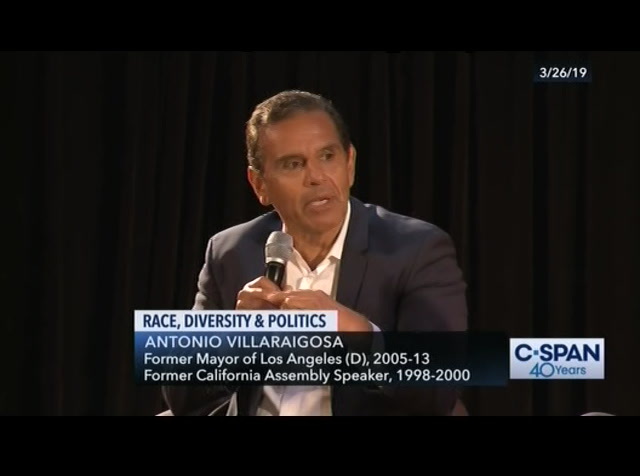 as speaker, you worked for the aclu, you marched with the united farm workers, pushed to expand health care by an additional 750,000 people, you champion issues like prison reform and law enforcement reform -- >> immigrant. food stamps for illegal immigrants because at that time, it was illegal. nobody was talking about that. 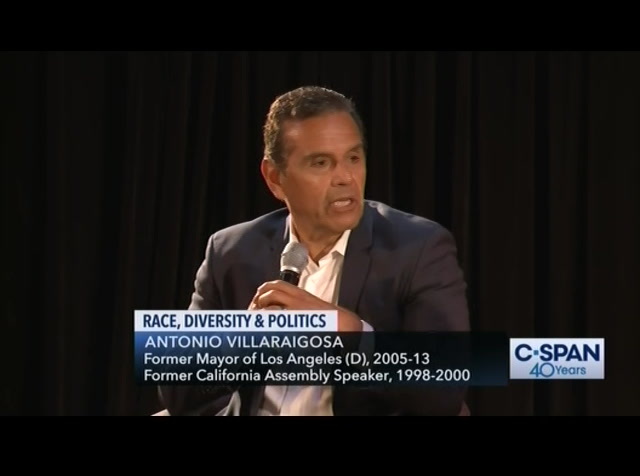 a latinod: was being speaker make it easier to champion those issues or difficult to champion those issues? 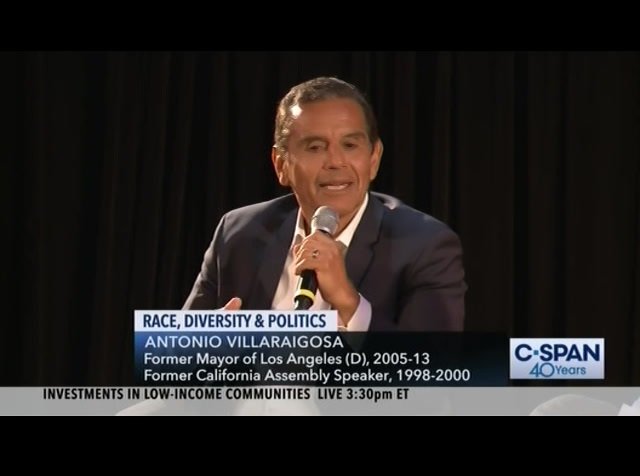 mr. villaraigosa: i was never a latino speaker. i was a speaker for everyone. that is probably why i was identified nationally as somebody, i was a coalition builder. i started out with the black student union. i was always someone who understood that strength comes in building a broader base of support. i was proud to be mexican. i'm an american-mexican. i've always been proud of my heritage. 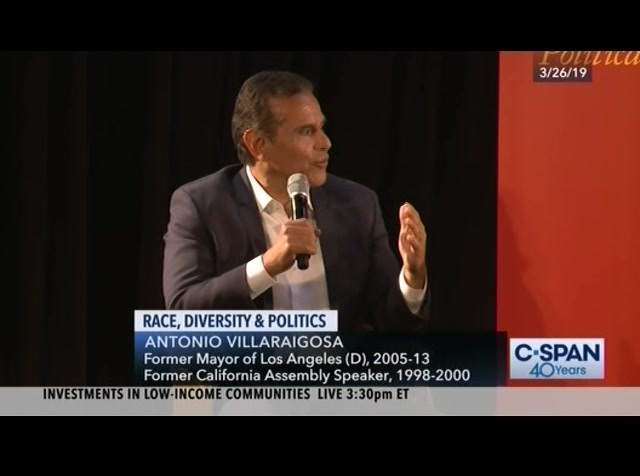 i was involved in a lot of community organizing around the latino community, but i knew that it was important in a city as important and diverse as california, los angeles, that i needed to be a leader for everybody. like this one, we want them to represent everyone of us. i was clear that that is what i was going to do, but i was never reticent to stand up for who i am. 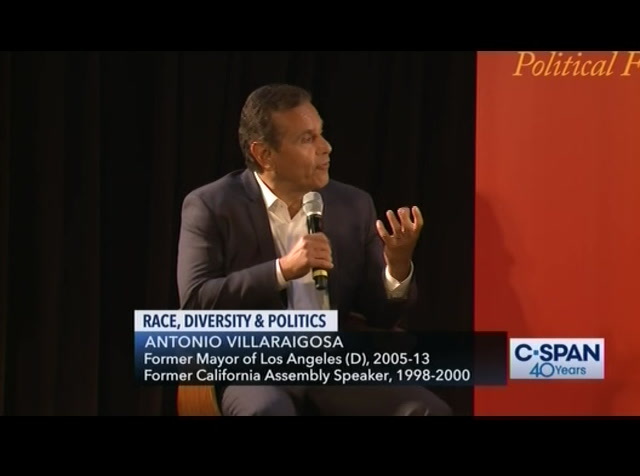 that is why i brought immigrants into the conversation in the 1990's when nobody was doing it. remember, this was right after proposition 187 that denied health care, even emergency health care to immigrants and a public school education. that is the environment i was operating on. it is a much different environment 25 years later. people are ahistorical about that. when i was speaker, there was concern even among the democrats that i focused on some of the issues that i did. sometimes i would joke -- what about me being speaker do you not understand? i got elected, and i believe this is how we grow our party and how we best serve the people of the state. even a conservative, it's a noise, frankly. 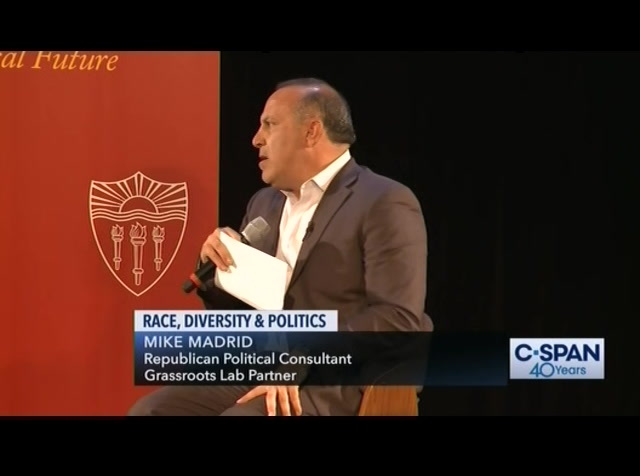 mr. madrid: do you feel a lot of similarity between what was happening in california in 1994 and what is happening nationally now? 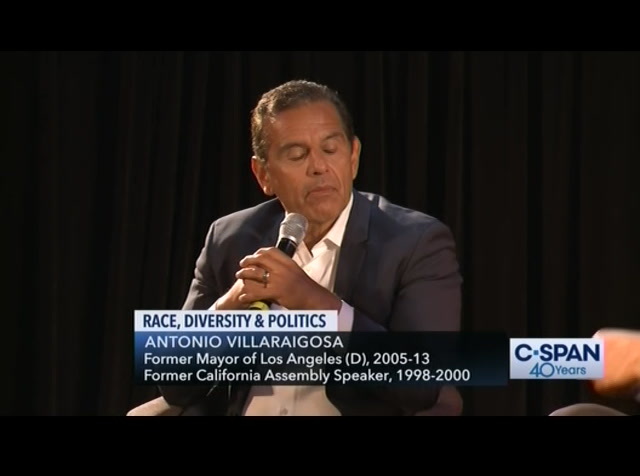 mr. villaraigosa: without question. 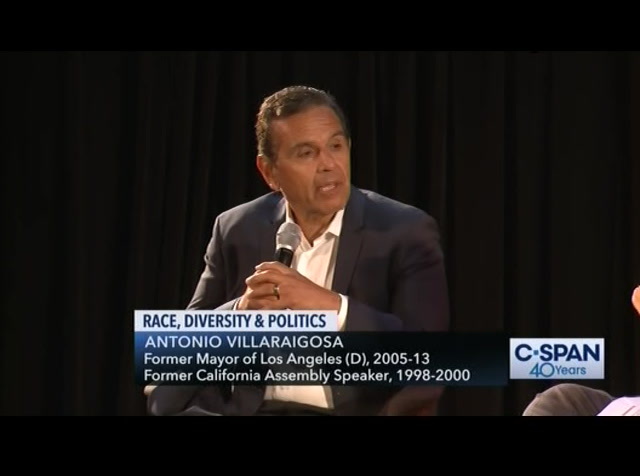 california is a bellwether state. what happens in california will ultimately happen in idaho, have said that many, many times. 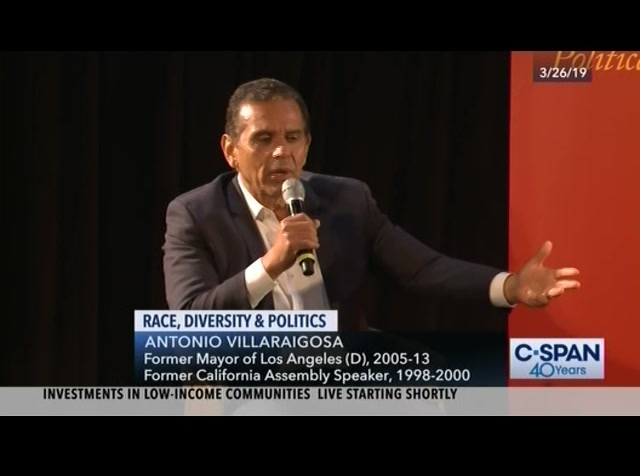 in the 90's and the 80's before that, there's the question that -- there is no question that the immigrant bashing that you see happening today across the country happened 20 some odd years ago before that in the 90's here. it didn't start with donald trump as some people think it started with donald trump in the republican party. 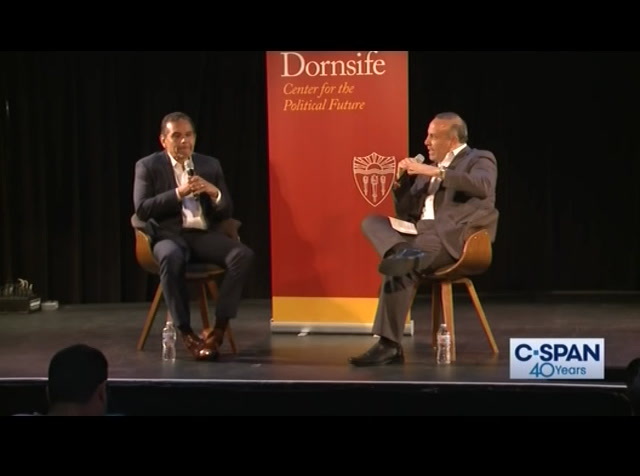 i tell people, since the end of the mexican-american war, bashing mexicans and immigrants has been a part of the political fabric of our nation. 30's. that name was an integrated name here in the state. 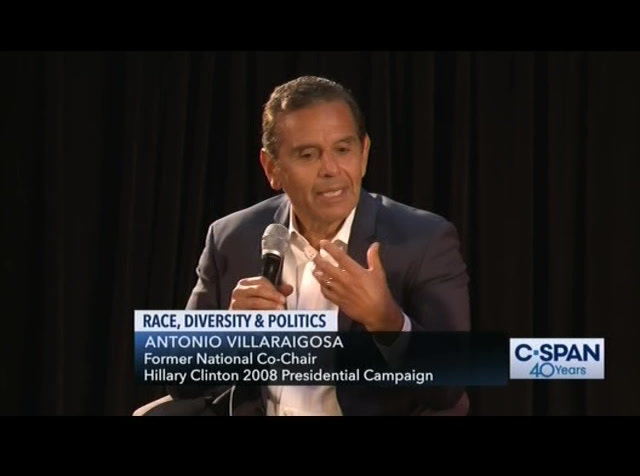 i remember hearing from latinos, even that not just others, saying, how are you going to get elected? latinos were only about 22% of the vote, they don't vote, we all know that. that was true then, as well. they don't vote in the numbers that everybody else does, how are you going to get elected? because i am everybody's mayor. as i said, i one in the primary and lost in the runoff. 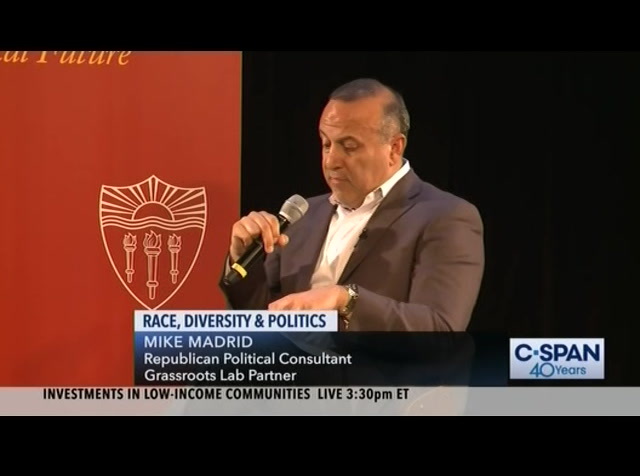 the papers at every turn described me as the latino candidate for mayor. i challenged them and i said, i was born here, my mother was born here, my grandpa got here hundred years ago. i say, why are you so touchy about it? you would be making history. 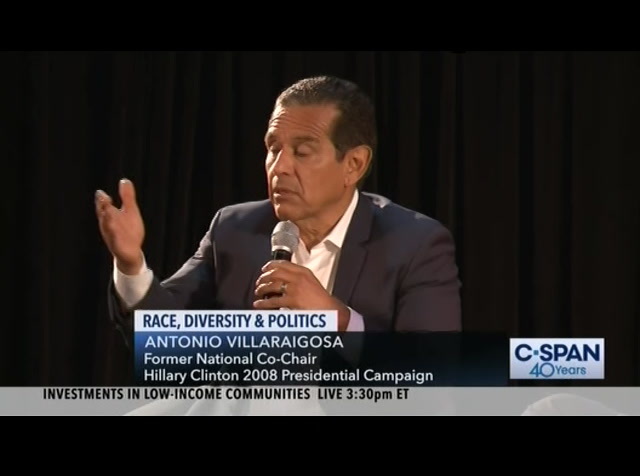 -- the person running for the current mayor actually talked a lot about being latino. while, -- wow, a lot has changed. the acceptance of that, when i was running, it was much different. it was a different dynamic. 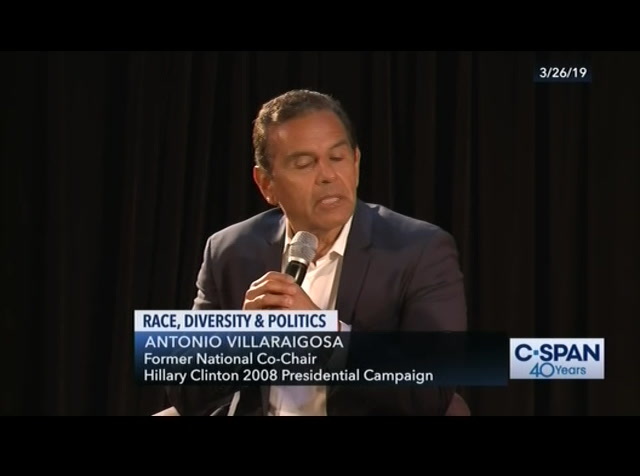 finally, i lost that first election in no small part because they did what they always do, someone of color in particular if you're breaking the glass ceiling, they will say you are soft on crime. i had voted against the death penalty sometime 79 to 1. the only person. they did a commercial where they showed the vote and it would votes green and 1 red. i voted against the death penalty because i wasn't for it. i don't believe in it. i don't think two wrongs make a right. it doesn't work. i have argued that since i was a kid, at least in college. followed enough of it. by the way, she had a great launch. probably the best launch of any of the candidates. she has been a friend a long time, a lot of respect for her. but i haven't followed the race to that extent. i will say, it is different. millennials don't see race in the same way their parents and their grandparents do. things have changed. there's the question. and for the better. but do we still have racism? of course we do, and a lot of it. 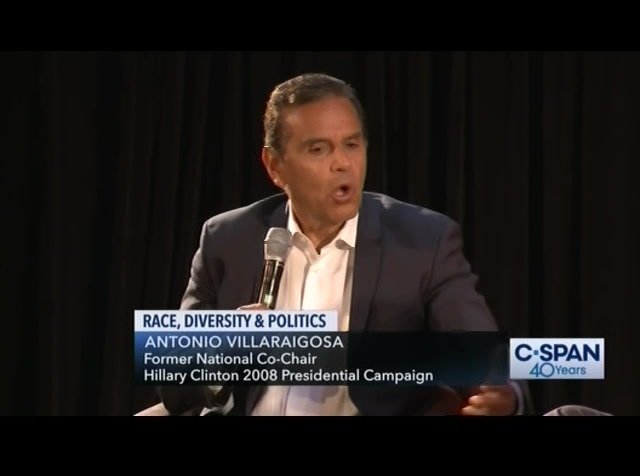 is a candidate of color sometimes in a fight, fighting with one hand? yeah. it is still a place where, you know, you have to be better than. you just do. my mother would always tell us that when we were kids. you have to work harder and be better. is disconcerting and concerning that the votes seem to have broken down in tribes. each candidate being supported by their group. since tom mr. madrid: does it trouble you? mr. villaraigosa: of course it does. we have a lot of work to do. to bring people together, what i was always proud of was i was the first since tom bradley to be a coalition builder who understood that if i was going to break this glass ceiling, i had to convey what i always lived, that i wanted to be a leader for everybody and bring us together. people thought i was corny, that's what a mayor does. we speak 120 languages. our kids has a shot at a better life. you know, i often hear, should we be for the white voters because they are the majority, or should we focus more on latinos or african-americans and asians, and native americans, and my response is, why can't we do both? 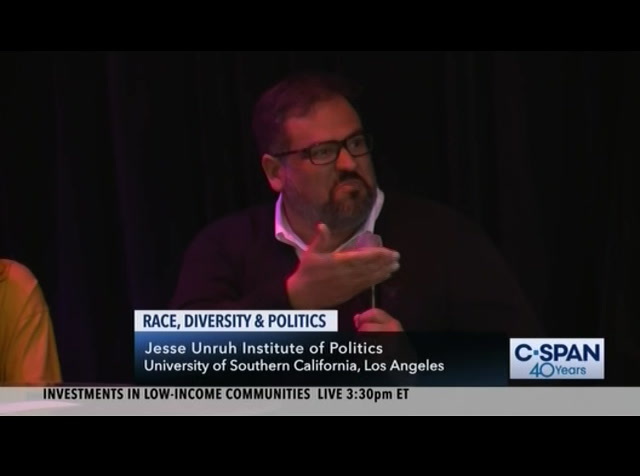 why can't we speak to an economy who is not working for people, particularly people of color? why can't we speak to that more and more, the opportunity in america is becoming elusive? , we were to the oecd in the top one, top three, top five for a long time, today we are 16th in the world, where you start at the bottom and go to the top. so i think we have to do something about that. and i think we can do both, and we need our politics to be about both. i'm a democrat, i chaired the party convention, unabashedly a progressive, notwithstanding with some of the noises about me. but i do believe what we are striving for is a society where one of us counts, and every one of us is represented. and we are clearly not there yet. 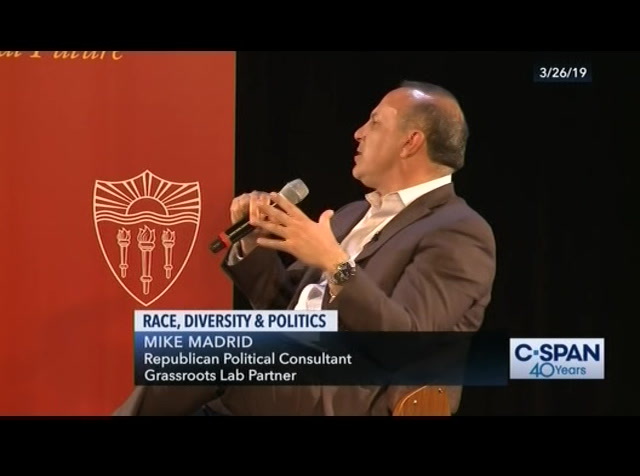 mr. madrid: i want to talk about beto o'rourke. 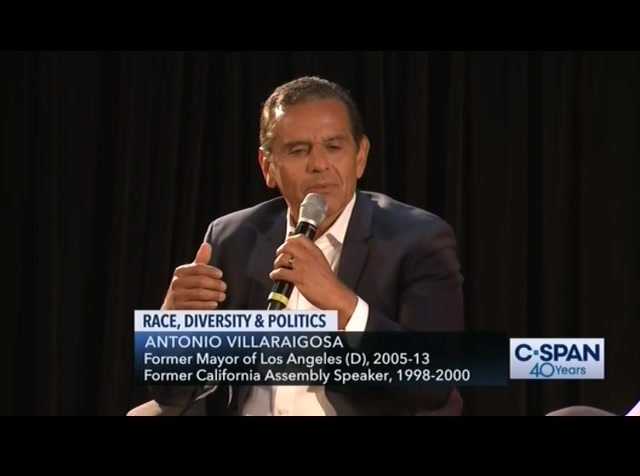 mr. villaraigosa: it's funny, when i first heard about him, i wasn't seeing a lot, i don't watch a tv. i read a lot. and i heard he speaks fluent spanish, and his name is beto, and he is from texas, i just , maybe it's a stereotype, but i just thought he is latino. and over the course of his election, i realized he wasn't. mr. madrid: what does that say? 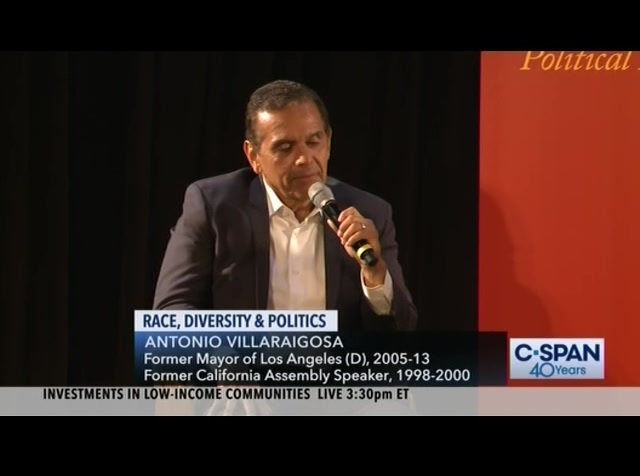 mr. villaraigosa: i will tell you, hey, good for you. 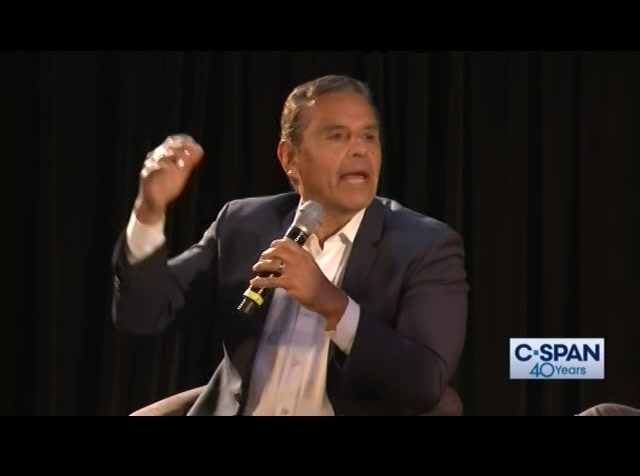 that you thought, you are representing the community in the south of texas, many of whom are spanish-speaking, and you thought it important enough out of respect to their community that you learn spanish. what is a good thing. this is the only country, one of the few countries where we don't speak multiple languages. we should be speaking two or three languages. and by the way, when they wrote that article about me being speaker, that i was the first one, i said yes, today we speak english and spanish. why? because they are the fastest-growing community in this state, but in 100 years, asians will be the next speakers -- asians will be. and the next speaker should speak chinese as well. of theirtion a member own party in the white house is not healthy for our country, so i do hope they change. maybe the moderate label came from the other side. i don't want to hit on hate on't want to republicans,. . -- i want to win them over. i want to when the majority of our country over to the notion that the path that obama talked about of creating a more perfect union, that's the path ahead that health care is a right, not , a privilege, everybody ought to have it. the notion that we shouldn't have open borders, it's ridiculous. every country in the world has immigration policies and a border, and they should be erare, particularly in this , but they should be humane. they should reflect our values. 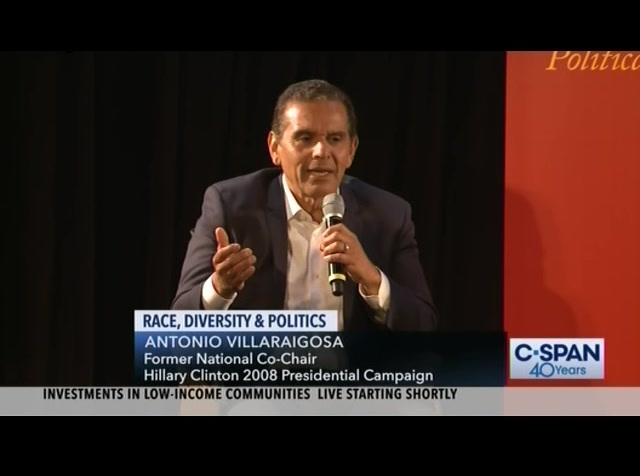 if we want to do something about immigration to the candidates running, we have to invest in the center countries. we wanted to build up europe after world war ii, a devastated europe, we developed the marshall plan. if we want to deal with immigration, you don't put up walls, you build bridges and you make investments in communities that are sending people here in great numbers. the truth is, more mexicans are going back then are coming forward that's the truth. , and yet, we have a person in the white house that calls them rapists, criminals, we have to be smart and be the country that really does reflect our values. so once again, we can be a beacon of hope and light to the rest of the world. the aisle, almost exclusively on our side of the aisle. but i would like to see that in the republican party and around the country. i think that is who we want to be. mr. madrid: i'm going to open it up to questions now. you have to hold the mic really close for the camera and some of the audio. we had some question -- we had some questions earlier. we will goa -- we will go ahead and let you handle the questioning. >> hi. 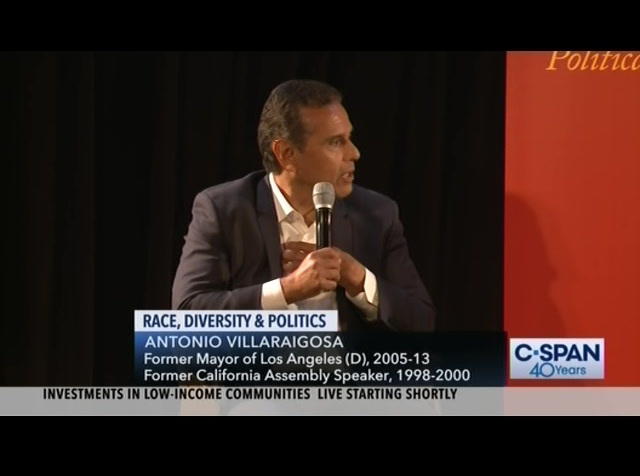 mayor villaraigosa, you characterize donald trump as someone that is not a true republican has hijacked and does not represent the gop. many people, however, would actually say donald trump is a symptom of the problem, not the problem itself that he really , does represent the political interest of the republican voting base. how would you respond to that point of view? 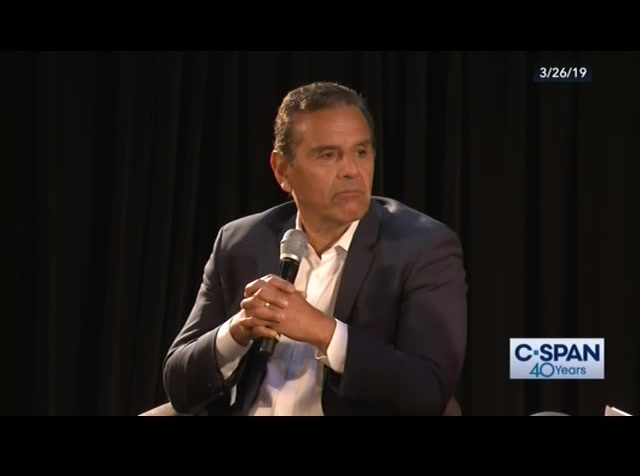 mr. villaraigosa: i support that view. they obviously are voting for him. but when you look at traditionally who the republicans have been, here's an example, the party of fiscal conservativism. they just voted for a tax cut in the house and the senate that is sending our deficit and our debt into the stratosphere. usually, what you do when you do tax cuts, you cut something else so that you can pay for it, or you raise money to pay for it, they did not do that. across the board, ronald reagan did the last major immigration bill. he was a republican. republican candidates causes and , issues of until recently, antonio and i actually have a lot of anecdotal stories we can tell about some of the challenges we had in working together, but it was never personal. 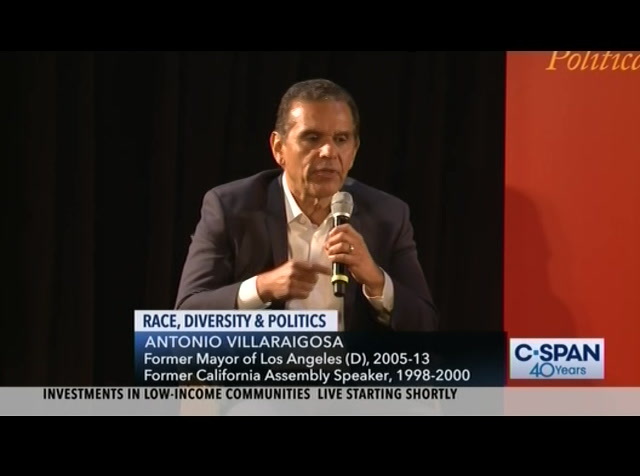 that is what i understood about then-speaker villaraigosa right away. and we also shared a lot of common beliefs about the poor, or the need to help our fellow man and the least amongst us. we just have very different ways of approaching those solutions. what it comes down to is, i never questioned where his heart was and what his goals were. and as long as i could believe in that, even if i couldn't support him on a lot of policies, i could support him because he was still advancing that broader agenda. three, the superrich, and we have been reading in the newspaper about them, and then the poor. the poor are not getting the deserve and , democrats are not speaking out about it. when i became mayor, one out of three schools were failing in this town, one out of three. a 43% graduation rate. i took that on. because i told people, it is not just about being the first, it's to open up the door for the rest. but how are you going to open up that door if 44% of the people are graduating from high school? and latinos, who are 80% of the school district, only 13% have a college degree? 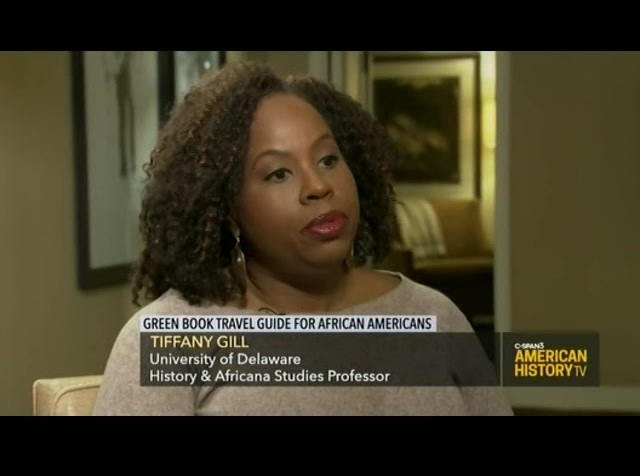 and african-americans, who are about 11% of the school district, about 18%. we are not making the numbers we need to make it in and nobody is , challenging that. and that is the opportunity of what is going on today with people buying entrance into great, and that is, you know, poor people, the kids of the working class, they don't have that. your dad was a teamster, son. i had the honor of meeting him. he worked hard so that you could get into usc. nobody bought your way into this place. and you know, they got rid of affirmative-action. . by the way i was one of the , people that led that fight, i contributed $25,000 and did debates, debated governor wilson at the time on npr. i fought for this notion. i said, hold it. you say everybody should have a , level playing field, but we don't have a level playing field. enough for working-class people trying to make it who want to be a part of that dream. so yeah, i'm going to say it we are invisible. you don't see us fighting hard enough for them. that's why we have to get money out of politics, and citizens united. it is why we, it is good that we are having the debate in both , parties. to they are going so far right they are falling off the cliff of the flat earth they believe in, but on our side, too, we have to have a conversation. we have to remember this, if you want to win, you have to win that middle, too, and you have to speak to a bigger cross-section. that is what i am going to continue to do. we have to speak to a bigger cross-section of america. 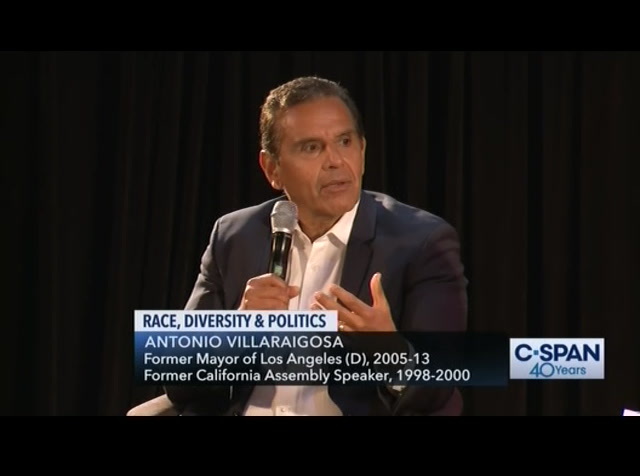 Antonio Villaraigosa, a former Democratic mayor of Los Angeles, hired Republican political consultant Mike Madrid to work on his 2018 campaign for California governor. The University of Southern California Jesse Unruh Insitute of Politics hosted Antonio Villaraigosa and Mike Madrid for a conversation on race, diversity, politics and the race for the White House.